Screening tests help find colon cancer before any symptoms develop. Screening means checking or testing for disease in a group of people who don’t show any symptoms of the disease. The Canadian Cancer Society recommends that ALL Ontarians ages 50 and over be screened for colon cancer regardless of sexual identity. How can you tell if you’re at increased risk? Know your risk factors and talk to your health care provider or call Telehealth Ontario at 1-866-797-0000 or TTY: 1-866-797-0007 and speak to a nurse about conducting a risk assessment. This test finds blood in the stool that is not visible to the naked eye. Polyps and/or tumours in the colon have blood vessels that can release a small amount of blood onto the stool when it passes by. 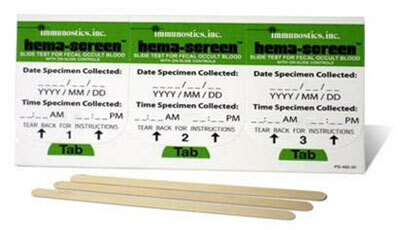 Stool tests check for occult (hidden) blood. The stool test helps identify polyps before they become cancerous. If you don’t have a health care provider call Telehealth Ontario at 1-866-797-0000 or TTY: 1-866-797-0007. A nurse will take down your information, conduct a risk assessment and, if you are eligible, will mail you a kit. You’ll be asked to collect stool samples on three separate days. However, you should avoid collecting samples if blood is visible in your stool or urine. For instance, if you have your period, bleeding haemorrhoids, or a urinary tract infection, it’s not a good time to do a stool test. When you’ve collected all of your samples, you can pop the kit in the mail. The envelope is pre-addressed and the postage is paid, so all you have to do is pop it in the mail when you’re done or drop it off at a local community laboratory collection centre. ColonCancerCheck was launched to the public in the spring of 2008 as the first population-based, organized colorectal screening program of its kind in Canada. The goals of ColonCancerCheck are to reduce deaths from colon cancer through an organized screening program, and to support health care providers in providing the best possible colon cancer screening for their patients. If you don’t have a health care provider and received your kit from Telehealth Ontario, and you have a positive test result, ColonCancerCheck will notify you of your test result and will work with you to find a health care provider to arrange for follow-up care. You will be asked to take off your clothes during the test, and you will wear a paper gown. It may help to call ahead to the screening centre to speak to a booking clerk, receptionist or technician to discuss what practices are in place to make reception, changing room, waiting area and test procedure as stress-free as possible for you. You can ask about how they will accommodate any of your access needs. For some LGBTQ people, being out to your doctor is important to getting the health care that we need. To others, it can make getting adequate health care more difficult because of the fear of experiencing homophobia/transphobia and/or provider misinformation. Coming out is your personal decision. If your colonoscopy finds no cancer, polyps or any other problem, you do not have to get another colonoscopy for ten years. At that point, you will go back to getting an FOBT every 2 years.